We will only use customer information to tell you about future events, if you choose to receive such announcements. Furthermore, we will not sell or exchange names or any other information about our online customers. We will not collect, share or sell any information that is not addressed in this statement. Data collected may be shared with a company under contract to us for internal analysis and marketing purposes only. Dynamic Data.Our webserver collects click-stream data and HTTP protocol elements in access logs, used solely for the GMI Website functionality, traffic analysis, research and development. We use IP addresses to track only aggregate information regarding site traffic. An IP address is an identifier for a computer or device on a Transmission Control Protocol/Internet Protocol (TCP/IP) network, such as the World Wide Web. Networks use the TCP/IP protocol to route information based on the IP address of the destination. In other words, an IP address is a number that is automatically assigned to your computer whenever you are surfing the Web, allowing Web servers to locate and identify your computer. Computers require IP addresses in order for users to communicate on the Internet, browse and shop. We do not collect any personal information via a user's IP address. The Compact Policy of Gaines Manufacturing Inc. is considered satisfactory according to the rules defined by the Platform for Privacy Preferences and Microsoft Internet Explorer. IE will accept cookies accompanied by this policy under the High, Medium High, Medium, Low, and Accept All Cookies settings. We invite you to contact us if you have questions about this Policy, or for information on how to opt-in or opt-out of use of your personal data. 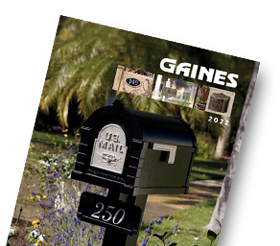 You may contact us by mail at the following address: Gaines Manufacturing Inc., 12200 Kirkham Road, Poway, CA 92064, USA.